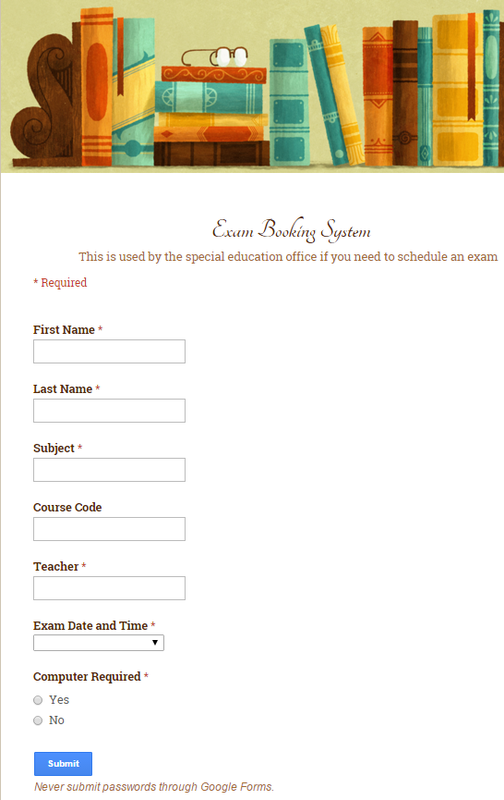 ​The main goal of the project was to create a test/exam booking system for students in special education to increase organization and decrease reliance on paper. 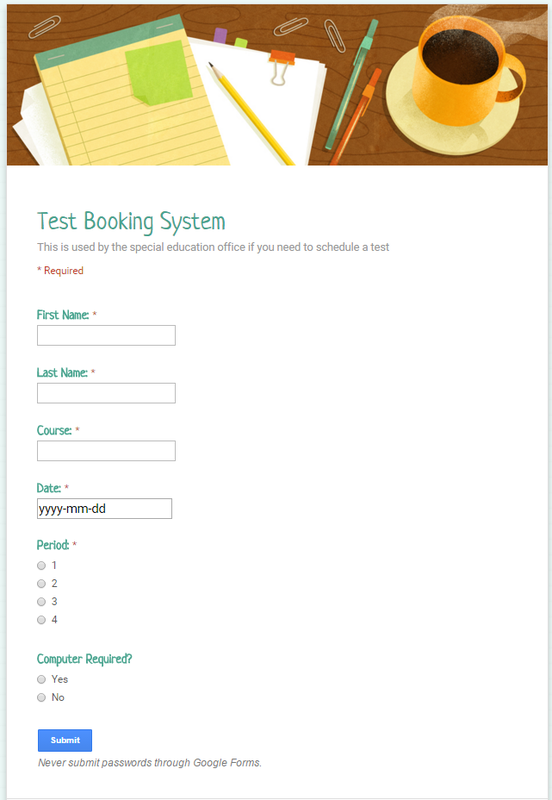 The Test Booking Form is a Google form used when students want extra help/privileges on a test in one of their courses. If they need extra time or a computer, they would write their name and information on the board and come at the appropriate time. However, the information could easily be lost if someone erased it from the whiteboard, and the writing is not always legible. To solve this problem, we created an online form where students entered the same information and once they submitted it, a Google sheets would automatically be updated with their data. The Exam Booking Form is quite similar, with a few differences. The general form is the same, but rather than selecting a date, students will choose between several options for days and times. This is to reduce the chances of students making errors and picking incorrect dates, and it also allows them to choose the morning/afternoon time, which was previously unavailable. This means the forms will have to be updated later in the year when exam times are available. By creating the forms, the same information would be entered (name, course, date, etc) but it would be saved into a database that is always accessible through internet, and there is no risk of illegible writing. There is no risk of losing the information as well as no need to waste paper/ink. The biggest drawback is the students must have access to the internet. This is beneficial to those needing extra help as well as teachers. Rather than having to remember at school/lose class time to sign up for extra help, students can do so from the comfort of their home, and don't need to worry about remembering for the next day. For the teachers, it's much easier for them to see and sort the student requests on the computer, and they have access all the time instead of just at school, allowing them to plan a lot more effectively. 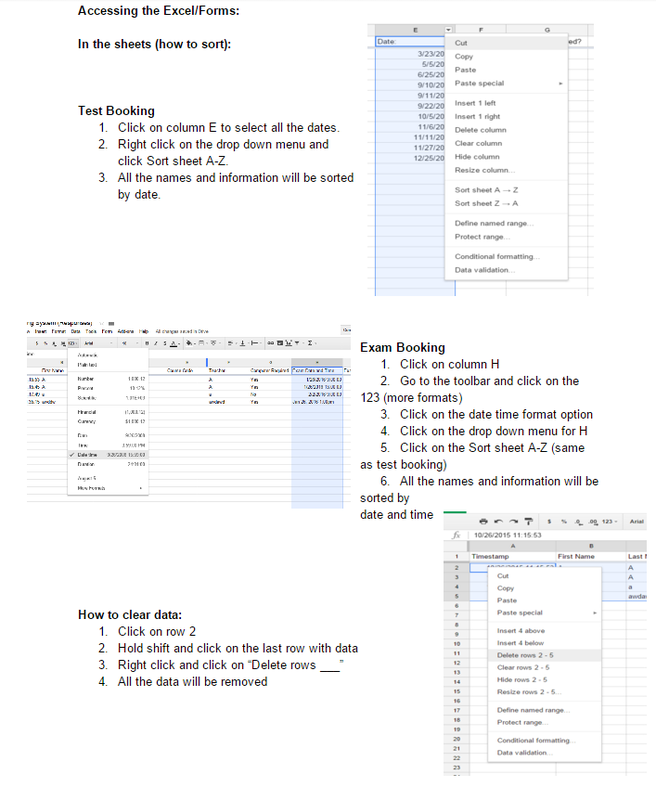 To see and organize the responses from the students, there is a Google sheets document automatically created that stores all the information in a table format. There is no need for additional formatting except the date/time column for exam booking. Once it's formatted correctly, the dates and times can easily be sorted in chronological order, which allows for better organization. Rather than copying down the list from the board/binder and then rearranging one by one, it is done with the click of a button. Since these forms have only just been introduced, they will be used together with the current system of the whiteboard and binder to give students accommodation for their tests/exams. Eventually, we hope to completely remove dependence on paper and implement these forms into other school areas. After creating these forms, a short 2 page manual explaining how to edit the forms and view/organize the responses. The manual consisted of screenshots of the important steps needed to use the forms/sheets, as well as sentence descriptions to ensure clarity. These will help make sure the technology can be used properly before it is integrated successfully into special education. 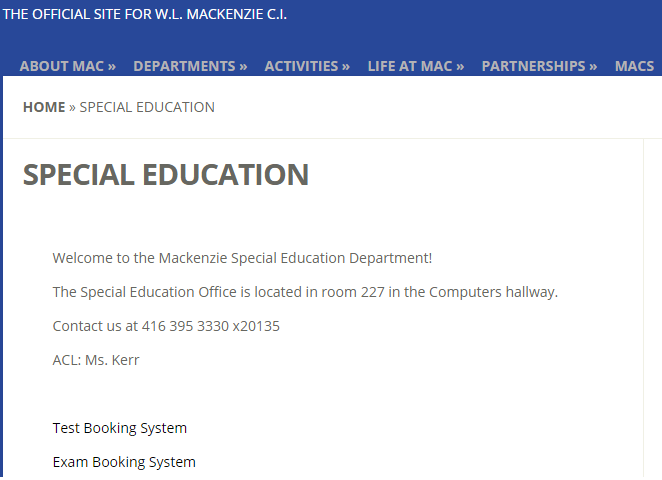 Finally, coordinating with the school website group, we created a new tab under departments called "Special Education" with the links so that students could easily find them when they needed. Google forms/sheets can be used in other subject areas, there are numerous possibilities. Although the Google forms were originally designed for test/exam booking, they can be altered for use in other subjects. For example, it can become an Absent Reminder Form, where students submit the date they will be away and teachers can organize/sort the responses. This will allow teachers to plan their lessons accordingly as well as minimize the risk of forgetting when students are absent. Another possibility is that these forms can be used for the actual tests as well as homework questions. If teachers assign homework questions, they can make them multiple choice or short answer and since the students have to submit it, it makes it easy to keep track of who completed the work. There would be less of a need for homework checking in class, and instead of printing assignment question for each student, it can be found paperless. As for the test option, tests can also include multiple choice/written answers. Add ons such as flubaroo to automatically grade assessments and send feedback to the students on what they got right/wrong. This can be really helpful for review/practice quizzes, and again, homework. A few other small uses include: surveys, planning with multiple people, and getting more familiar with technology.